Are you ready for the upcoming Christmas holidays? If you haven’t sorted out your Christmas presents and home decorations yet, here’s a perfect design idea! This embroidery design features two beige teddy bears swinging on beautiful Christmas balls. The two besties are wearing Santa hats. 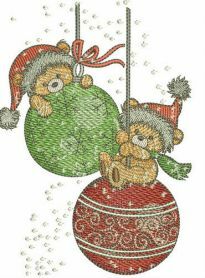 The green and red Christmas balls are decorated with exquisite twinkling ornaments. A mix of bisque, charcoal, honeysuckle, spruce, redberry and beige makes a lovely vintage palette. 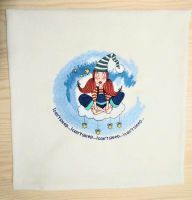 This needlework is a great addition to your presents including blankets, quilts, napkins, pajamas, sweaters, mittens, towels and much more. Great transaction. 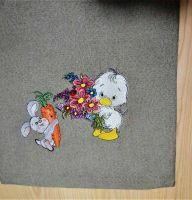 I loved the teddy bears stitched out great! Stitches out beautifully. Very fast response when ordering. Such a cute Christmas teddy bears for my embroidery library! The quality of digitizing is high. 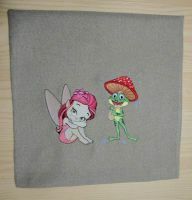 I decorated several towels with the design. Love the result. THanks to the seller! Arrived so fast I hardly had time to make a cup of tea before it was here! Lovely thankyou! Stitched out well.